the code for the desired effect. cmd(cyclecamera) - Cycle between First and Third Person View. cmd(selfsummon) - Spawn Another Riddick. if they are in line with one-another they will both be helpless. little axe-like club I think you'll really like. on their backs a couple of shot-gun blasts. a tattooed strongman named Iron Lord. Murder him to get this accolade. 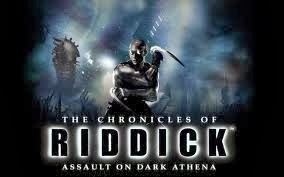 After Jaylor kills Silverman, he will challenge Riddick to a fair fight. Select the Bare Hands weapon and punch out Jaylor for this accolade. killing rust. When a guard isn't nearby, kill him. it to do it. So you can just kill him right away or listen to his rambling. He attacks you after you kill the guard in the other room anyway. His attack pattern is as follows: left to right swing, over head smash. shiv. Repeat as necessary to kill him. While dragging corpses, you can throw them forwards by pressing attack. a valve that's on, they will pass out. Even works on the riot guards. back after you kill Abbott, it won't be there. in New Venice North. Defeat the Drones, Athena mercs, and the Alpha drone. cliff. You can destroy it with one canister from the SCAR. Note: You can also find a Bounty Card farther down the walkway. a building to your right to find the second jammer, colored gold by the sun. Use the SCAR gun to destroy it. of some trees. Destroy it with the SCAR gun. the left to find the fourth jammer on the cliff, next to a crane-like device. between the side of the cliff and the top of a building. Complete the indicated task to unlock the corresponding accolade. Fair Fight - After Jaylor kills Silverman, he will challenge you to a fair fight. Use your bare hands to punch out Jaylor. Iron Lord - When hunting down Margo aboard the Dark Athena, kill Iron Lord. when a guard is not nearby. This Blueskin cannot be found afterwards. carrying guard you need to kill. Kill him immediately, or afterwards. soon as he dies. Note: It will not be here if you return after you kill Abbott. someone is suspicious about Riddick or has seen him.